Colin Trevelyan is a world traveller, admirer of unique cars and, from two locations in Hawke’s Bay, hosts possibly the largest collection of photographic memorabilia in the world – and he’s a marvellous storyteller. Trevelyan has a photographic memory, reciting histories, model numbers and quirky collector’s tales about his colossal camera collection that quickly morph into adventure stories of his exploits on the oilfields or his acquisition of rare classic cars. A few years back he moved his Living Image Vintage Camera Museum from Te Awanga to its current premises, only disclosed by phone appointment, north of Hastings. Still struggling for display and storage space, he then purchased the old National Bank building in Waipukurau to house 1,000 of his pieces, opening as the Millennium Museum of cameras and photography in time for the township’s 150th anniversary in October 2017. 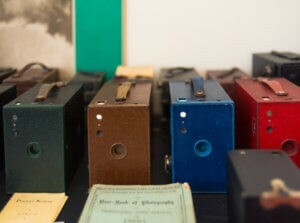 The 70 year old’s meticulously displayed and documented accumulation of photographic memorabilia – ranging from 1800s-era full-plate tripod box cameras to ‘affordable’ Box Brownies, instamatics, Polaroid’s and hybrid cameras that can capture digital and film – fill all seven rooms at the old homestead plus the dining room, lounge and passageways. All up Trevelyan has over 4,600 cameras … Kodak, Canon, Nikon, Polaroid, Pentax, Olympus and of course German camera makers – Voigtlander, Zeiss-Contax and his favourite collectible, the Leica range. As an added aside, he’s got laboratory x-ray machines, microscopes and binoculars dating back to the 1850s and the only complete set of Swatch watches commemorating 100 years of the Olympic games. The story behind rare cameras is part of the appeal; the original box and instructions get a peak rating, topped only by having the original receipt or ‘never-been-used mint condition’. 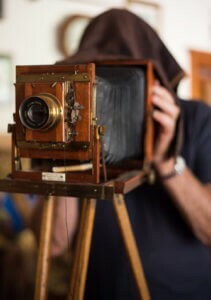 He has the Zeiss Ikon Contax owned by Herman Hess in 1930. “The German company tracked it back through the serial number confirming ownership.” He points to a gold-plated Leica created for the 1936 Berlin Olympics branded with the Nazi symbol, and insists he has the lens used to photograph Hitler that year. In every corner there’s another piece of photographic history – a National Geographic telephoto lens that cost US$42,000 in 1973; the camera owned by New Zealand’s first cricket rep, former All Black and war hero William M. Carson who died in WW2, and those that belonged to Hawke’s Bay’s fossil hunter, Joan Wiffin. He found a way to use film rather than glass plates … that was the start of his passion, which he insists is not an obsession. 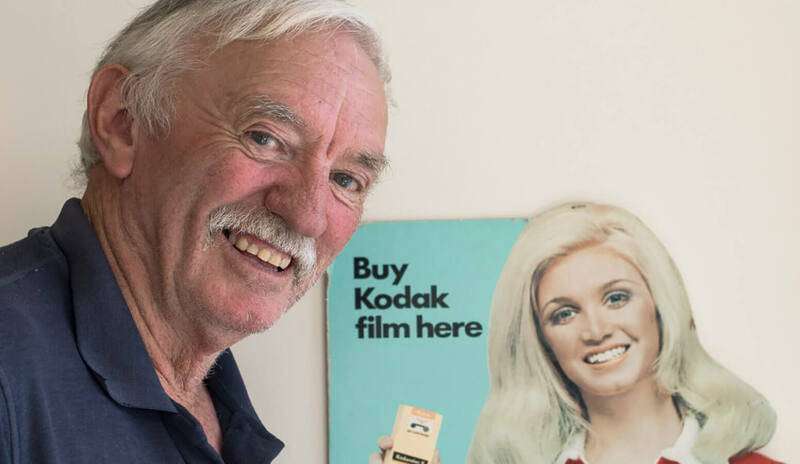 At the dawn of the 1960s he had a paper round, was part-time Waipukurau exchange operator and taking photographs at weddings and social events for Bob Partridge at Wendy Studios. He left school early to work as a linesman for the local Power Board, then signed on as a deckhand on a ship heading for South Africa. He got drunk, missed the return boat and ended up building power pylons to the gold fields. After bumming his way around Europe, he bluffed his way into a job on the oil rigs in Norway, eventually rising through the ranks acquiring highly-paid skills. By 1990 he was with Schlumberger “in charge of 200 guys working two semi-submersible rigs off Iran and through Iraq, then off Malaysia.” He claims to have been around the world over 100 times with the oil industry and was still consulting even after his retirement in November 1999. During his shore leave he would return to Hawke’s Bay, purchase property – at one time owning 17 houses in Te Awanga – and accumulate cameras. The era of film cameras is long gone, but there’s a certain nostalgia among enthusiasts familiar with the days of the dark room and its chemical bath processes as negatives were turned to positives and hung out to dry. Trevelyan still has his own darkroom, although film is hard to get and processing an arcane art. He purchased 20 rolls in New York late last year and chemists no longer sell the chemicals due to concerns about drug manufacture — no courier will touch the one litre bottles of developer that have to be bought in from Auckland. 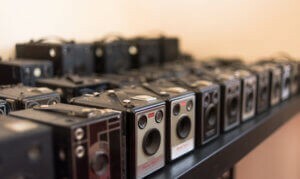 He doesn’t believe digital cameras will ever be collectible, because the circuitry and batteries keep changing. He did, however, splash out $16,000 on a digital Leica in 2006, but then a stain appeared in the window. He was offered a more expensive S2 plus lenses, but he declined. Knowing they only made 50, he asked why they didn’t have one in their museum? “Well, we thought we had one about 5 minutes ago”. He still has his digital Leica; the stain doesn’t impact the photos and “that camera will fit any of the older lenses back to 1920”. During WW2, Leica made cameras for the German army and airforce and via Switzerland sold to the Americans and British. Founder Ernest Leitz operated the Leica Freedom Train relocating Jewish workers and their families to Canada, France, Britain, Hong Kong and the United States so they wouldn’t be sent to Hitler’s concentration camps. Part of the local Leica appeal is that many New Zealand soldiers after returning from WW2, returned to the battlegrounds of Europe in the 1950s where they purchased a car and a Leica camera, which was “like the Crown Jewels … costing upwards of £270 to £400”. Trevelyan grabbed his fair share when they were being sold off about 20 years ago. He’s still got a keen eye to complete sets of sought after models. A little old lady, visiting his Waipukurau museum in late 2017 with a busload of retirees, announced she had an old Kodak box camera. “I thought, ‘Oh god, not another one’ and then she said, ‘I noticed you didn’t have a grey one’.” Trevelyan’s interest was piqued. Kodak made a hundred thousand or so red, green and blue Box Brownies but only 10,000 grey ones which were “very hard to get”. The compulsive camera collector was determined to acquire the extensive inventory of Aerial Mapping Hawke’s Bay, founded by Piet van Ashe. Aerial Mapping took New Zealand’s formative aerial survey maps and conducted ‘mapping’ flights for the Americans in Afghanistan from the late 1970s. Entering the 21st century the company was sold, but new owners failed to invest or move to digital technology and it went into liquidation in 2014. Trevelyan also purchased the old Bridge Pa Aero Club buildings where Aerial Mapping’s remaining assets were stored including a 660lb (299kg) camera.